Thousands of visitors come to Hot Springs National Park each year to relax and enjoy the famous, soothing thermal waters of its 47 hot springs. Known as “The American Spa,” this urban park is located in the Diamond Lakes region of the Ouachita Mountains in central Arkansas and covers 50,000 acres of mountains. Despite the extreme heat of Arkansas summers, park rangers stay visible and accessible to locals and tourists by patrolling the park and town on bikes. The park decided to put officers on bikes in 2006. 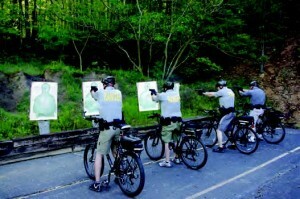 It sent five officers to an extensive training program at International Police Mountain Bike Association. That training included how to perform crowd control, shoot firearms and take down fleeing suspects while on a bike, as well as safety procedures and state laws for biking on the roadways. A few years later, the park sent five more officers to the training. Rangers usually dedicate a couple of hours a day on about half their workdays to bike patrol. “It’s not advantageous to be on the bike all day,” says Johnson. When bike patrolling, they tend to cover the park’s 30- mile trail system, which is a lot more ground than if they were walking. They also patrol the downtown area, which is where most visitors come to enjoy the springs. 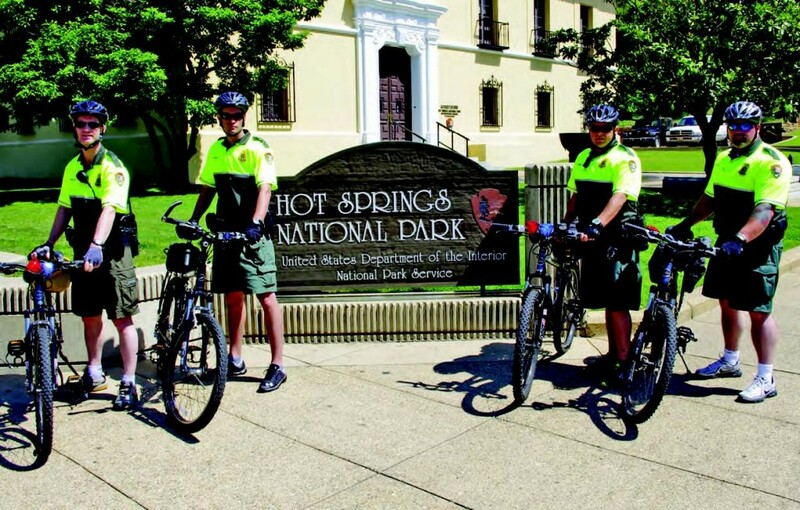 Hot Springs National Park bike patrol rangers practice handling themselves and their bicycles in a variety of different situations. “When we are on our bikes, we want to be visible to people, so we tend to go to heavily populated areas,” says Johnson. The biggest challenge is the heat. Officers are required to wear body armor and a bullet-resistant vest, as well as other gear. Rangers are encouraged to stay in shape and required to exercise at least three hours each week, which is built into their work schedule. Each year they also undergo a physical efficiency battery test as well.